With some films, there’s an intense connection that you can’t fully explain. It resonates deep inside of you, in that cloud of unconsciousness. At the risk of sounding a little hippy-dippy, director David Fincher’s THE CURIOUS CASE OF BENJAMIN BUTTON (2008) is one such film for me. It feels like a life that I’ve already lived before, despite the fact that I’ve never been to the South and I was born too late in the twentieth century to remember most of it. Yet, there’s something about the film’s eroded-paint interiors in particular that reminds me of a distinct time in my life, a time when I was re-discovering my hometown of Portland, Oregon with new eyes during summer breaks from college. I only realized it after my most recent viewing, but the film also sublimely foreshadows major developments in my own life: The treasured tugboat upon which Benjamin Button spends a great deal of his early adult years is named The Chelsea (coincidentally the name of my fiancée), and the love of his life is an elegant dancer (again, the soon-to-be Mrs.). I can’t make it through the film without tearing up a little bit (or a lot), especially during the last montage where Fincher shows us the smiling faces from Button’s life as Button himself opines in voiceover about how relationships are life’s biggest treasure. The scene utterly slays me. Every. Single. Time. THE CURIOUS CASE OF BENJAMIN BUTTON is based off the F. Scott Fitzgerald book of the same name, published in 1922. A film adaptation had been in development since the 1970’s, associated with a wide variety of big-time Hollywood names like Steven Spielberg, Robert Zemeckis, and Jack Nicholson. Due to the storyline of a man aging in reverse, which would require 5 different actors playing Button at various stages of his life, the idea never picked up much steam. A leading role split up between five men wouldn’t appeal to any one movie star, and the studio couldn’t justify the required budget with unknowns. After a while, most executives considered it to simply be one of those great screenplays that never got made. By the early 2000’s, executives began to realize that CGI technology had caught up with the demand for a single actor to portray Button throughout the ages. They brought FORREST GUMP scribe Eric Roth aboard to try his hand at a new draft, but the project really began generating momentum when Fincher, fresh off his success with 2002’s PANIC ROOM, became involved. Working with Spielberg’s producers Kathleen Kennedy and Frank Marshall (in addition to his own regular producer, Cean Chaffin), he developed the film simultaneously with his 2007 feature ZODIAC, which ended up going before cameras first. Fincher’s creative steerage was instrumental in securing the participation of Brad Pitt, and with the decision to forsake the novel’s original Baltimore setting in favor of New Orleans and its generous post-Katrina tax incentives, the project was finally given the greenlight after decades of development. Within Fincher’s filmography, THE CURIOUS CASE OF BENJAMIN BUTTON is just that—a curious case. It’s his most honored film, and certainly his most emotionally resonant and powerful. However, the film is not well-liked amongst the film community at large, let alone his devoted fanbase. It is commonly accused of maudlin sentiments, which at the time of its release were at odds with a cynical American mentality wrought by terrorism and an unpopular war abroad. However, as the long march of time strips the film of the context of its release, its fundamental integrity increasingly reveals itself. Like its sister project ZODIAC, THE CURIOUS CASE OF BENJAMIN BUTTON makes a strong case for one of the best films of its decade. THE CURIOUS CASE OF BENJAMIN BUTTON is bookended with a framing narrative that concerns an elderly woman named Daisy (Cate Blanchett) lying on her deathbed in a hospital while Hurricane Katrina approaches. She implores her daughter to read her a series of journal entries she’s saved in a box, all of them written by a mysterious man known only as Benjamin Button. His story begins on the eve of World War 1’s end in New Orleans, where a baby is born with quite the defect: severely wrinkled skin and a frail condition that’s consistent with an old man at the end of his life. The baby’s mother dies during labor, and the father, wealthy button manufacturer Thomas Button (Jason Flemyng), flees with the baby in horror, abandoning him on the back steps of a nursing home. The home’s caretaker, a fiercely maternal soul named Queenie (Taraji P. Henson) discovers the baby and takes him in as her own, giving him the name of Benjamin. The child confounds all expectations as he continues growing up into an elderly-looking little boy, appearing better and healthier every day. Benjamin (Brad Pitt) fits right in with the residents of the creaky old nursing home, and they become something of an extended family around him. One day, Benjamin meets a precocious little girl named Daisy, who sense just how different he is, and they begin a lifelong friendship. As the years give way to decades, Benjamin continues to age in reverse, becoming more youthful and virile as he sets out into the world on a grand adventure that places him against the backdrop of the 20th’s century historical moments. He becomes a master sailor, battles Nazi submarines in open waters, and even experiences a secret love affair with an old married woman (Tilda Swinton) in Russia. When Benjamin returns home from his adventures, he finds Daisy has grown into a beautiful young woman as well as a successful ballet dancer in New York. Their attraction towards each other alternates erratically, never overlapping until Daisy’s career is cut short after getting hit by a taxi in Paris. Middle age sets in, and as Daisy becomes acutely aware of her mortality, she and Benjamin finally give in to each other and start a grand romance. When Daisy announces she’s pregnant, Benjamin becomes withdrawn emotionally—he’s reluctant about becoming a father because as the child grows, he’ll only get younger still and, as he puts it, “(she) can’t raise the both of us”. As Benjamin’s singularly unique life plays out, the film reveals itself to ultimately be about the heartbreak of age and time. It plays like a melancholic yearning for youth, while at the same praises the experience of life and living it to the fullest with the time you have. Brad Pitt’s third collaboration with Fincher is also his most sophisticated. As Benjamin Button, Pitt needs to be able to convey a complex life through all its various stages and differing attitudes. The main through-line of Pitt’s performance is that of a curious innocent, who soaks in everything around him with wide-eyed glee because he was never supposed to live long enough to see it anyway. The majority of Pitt’s performance is augmented by CGI, but his characterization is consistent and his physicality is believable across the spectrum of age. Simply put, Pitt’s performance is a career-best that takes advantage of his off-kilter leading man sensibilities. Blanchett’s Daisy is an inspired counterpart as a complex character who is both tender and cold, idealistic and practical. Like Pitt, Blanchett must convey the full spectrum of womanhood with her performance, and does so entirely convincingly (with a little help from CGI “youth-inizing” techniques and conventional makeup prosthetics). Tilda Swinton plays Liz Abbott, Benjamin’s mistress and lover during his short residency in a grand, old Russian hotel. Swinton, like Blanchett, is capable of playing a wide variety of age ranges, and here performs beautifully as an older, sophisticated and worldly woman who introduces Benjamin to the world of caviar and secret love affairs. As Benjamin’s adopted mother Queenie, Taraji P. Henson is a revelation. She projects a strong, resilient dignity that allows her to essentially run the show at the old folks home Benjamin lives in. Mahershala Ali, better known for his role in Fincher’sHOUSE OF CARDS series, works for the first with the director here as Tizzy, Queenie’s lover and a distinguished, mild-mannered father figure to Benjamin. Jason Flemyng plays Benjamin’s real father, Thomas Button, as a man besieged by melancholy over how his life has turned out. He’s a rich man, but all of the money in the world couldn’t have prevented his current situation, so he keeps Benjamin at an emotional distance until its time to pass his legacy and wealth on. And last but not least, Elias Koteas— in his second consecutive performance for Fincher following ZODIAC—plays Monsieur Gateau, a blind clockmaker. Consumed by grief after losing his son to the Great War, Gateau constructs a clock that hangs in the New Orleans train station and runs backwards—thus paralleling Benjamin Button’s own life. THE CURIOUS CASE OF BENJAMIN BUTTON furthers Fincher’s foray into the digital realm. Working with a new visual collaborator in cinematographer Claudio Miranda, Fincher once again utilizes the Viper Filmstream camera to establish an all-digital workflow. Indeed, not a single frame of the film was ever printed to film before the striking of release prints. Acquisition, editing and mastering was done entirely with bits and pixels— ones and zeroes. Presented in Fincher’s preferred 2.40:1 widescreen aspect ratio, the film is easily the director’s warmest-looking picture to date. The frame is tinged with a slight layer of sepia, while the warm tones veer towards the yellow part of the color spectrum and a cold blue/teal cast defines the current-day Katrina sequences. The incorporation of practical lights into the frame creates a high contrast lighting scheme while making for moody, intimate interiors that evoke the old world feel of New Orleans. Fincher’s color palette deals mainly in earth tones, which makes the presence of red (see Daisy’s dress during their first romantic date) all the more striking when it finally appears. Red in general seldom makes an appearance in Fincher’s work (except for blood, of course), a phenomenon that can be chalked up to Fincher’s self-avowed aversion to the color as it appears on film due to its distracting nature. However, with Daisy’s dress in particular, the costume designers were able to convince Fincher that the distraction served a legitimate story purpose. For a director well known for his dynamic sense of camera movement, THE CURIOUS CASE OF BENJAMIN BUTTON is a surprisingly sedate affair. While certain key moments are punctuated with dolly or Technocrane movements, for the most part Fincher is content to let the frame stay static and allow the performances to take center stage. This approach is bolstered by returning production designer Donald Graham Burt’s exceptional period reconstructions (themselves augmented with CGI and digital matte paintings). Fincher’s regular editor Angus Wall stitches everything together in a deliberate, meaningful fashion that eschews flash in favor of truth and emotion. Kirk Baxter joins Wall, and would go on to become part of Fincher’s core editing team himself. For the film’s music, Fincher collaborates with Alexandre Desplat, who creates an elegiac, nostalgic score that sounds lush and romantic. Desplat’s work stands in stark contrast to the moody, foreboding scores that Howard Shore or David Shire created for Fincher’s earlier films. Fincher supplements Desplat’s whimsical suite of cues with several historical needledrops that fill out the period: southern ragtime, R&B crooner hits like The Platters’ “My Prayer”, and even The Beatles’ “Twist And Shout”. Above all of these, the incorporation of Scott Joplin’s Bethena waltz stands out as the most powerful and cutting of cues (in my mind, at least). The song is as Old Time Dixie as it comes, but it’s a nostalgic little tune that resonates with me on a very strange level. I can’t hear it without tearing up a little, and I can’t figure out why besides the obvious beauty of the song. The best way I can describe it as if it’s some remnant from a previous life that only my unconscious soul recognizes—which is an odd thing to say coming from a guy who doesn’t believe in reincarnation. For a lot of people, THE CURIOUS CASE OF BENJAMIN BUTTON doesn’t feel like a Fincher film, mainly because of its overall optimistic and sentimental tone that stands at stark odds with the rest of his emotionally cold, nihilistic filmography. However, the film is right in line with the trajectory of Fincher’s other thematic explorations. While the passage of time is a key theme specific to the film’s story, it builds upon the foundation that Fincher established in ZODIAC (a story that also took place over the course of several decades). The old world New Orleans setting allows for lots of Victorian/classical architecture in the form of ornate southern mansions and municipal buildings that, as the years tick by, give way to a distinct midcentury modern feel (see the duplex where Benjamin and Daisy’s daughter is born). 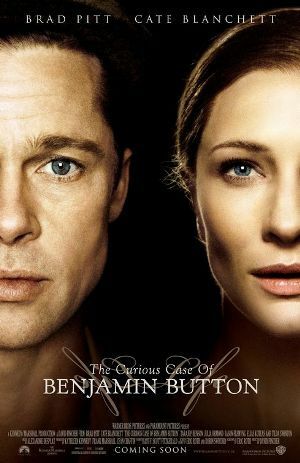 And finally, despite being shot on digital, THE CURIOUS CASE OF BENJAMIN BUTTON plays with the artificial constructs of the film medium. Flashback sequences, like the blind clockmaker scenes and a man getting struck by lightning seven times are treated to look like old silent pictures from the Edison era—jittery frames, contrast fluctuations, and heavy scratches, etc. These filters, applied in post-production, serve to differentiate the flashbacks from the sumptuously-shot main story, but they also clue in to a curious phenomenon that has risen out of the industry’s quick shift into digital filmmaking: the treating of digital footage to look like film, which is akin to a vegetarian trying to make a soy patty taste just like the chicken he refuses to eat in the first place. To my memory, THE CURIOUS CASE OF BENJAMIN BUTTON is one of the earliest instances of applying filmic artifacts onto a digitally “pure” image, along with Robert Rodriguez’s PLANET TERROR in 2006. It’s a commonly held tenet that age softens even the hardest of personalities. The production of THE CURIOUS CASE OF BENJAMIN BUTTON saw Fincher enter middle age and come to grips with his own mortality after the death of his father. As such, the film stands as a testament of an artist looking back on life and softening his edge without sacrificing who he is. The film’s release in 2008 was met with modest commercial success and polarized reviews, with some deriding it as aFORREST GUMP knockoff while an equally vocal contingent hailed it as a technical triumph and a masterpiece of storytelling. Fincher had his first real brush with the Oscars after the film’s release, with his direction receiving a nomination in addition to a nomination for Best Picture amongst a slew of actual Oscar wins for its groundbreaking visual effects work in seamlessly mapping a CG face onto a live-action body performance. The cherry on top of the film’s success was its induction into the hallowed Criterion Collection, which—while met with scorn by Criterion fanboys for its perceived maudlin mawkishness— earned Fincher his place in the pantheon of important auteurs. It is an admittedly easy film to dismiss for cynical reasons, but THE CURIOUS CASE OF BENJAMIN BUTTON holds many treasures for those who choose to embrace it. Like its unique protagonist, the film will persist through the ages precisely because of its poignant insights into the meaning of our fragile, fleeting existence on this earth. THE CURIOUS CASE OF BENJAMIN BUTTON is available on high definition Blu Ray via The Criterion Collection.